Five weeks ago, 156 opposition Members of Parliament voted to support a motion of no-confidence in the Canadian Government. And they declared the government in contempt of Parliament. Conservative Canadian Prime Minister Stephen Harper was forced to adjourn the Parliament and call for the fourth election in the last seven years. Canada’s electorate was dubious about the call for a new election, but as the day approached, a tide of enthusiasm rose as did the fortunes of the New Democratic Party. 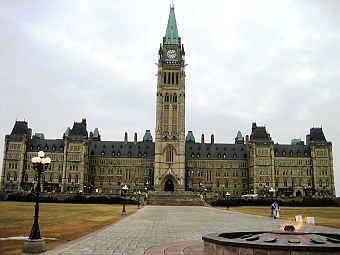 Monday, Harper’s Conservatives swept to a majority in Parliament while the NDP led by Jack Layton became the official opposition party for the first time. Michael Ignatieff’s Liberal Party and Bloc Quebecois led by Gilles Duceppe were handed stunning defeats in the election. Breaking down the results from election day are our guests Antonia Maioni, director of the McGill Institute for the Study of Canada, and Canadian Press Reporter Terry Pedwell. They look at the winners and losers and how Canadian-U.S. relations might be effected by the outcome. Plus, questioning the birthplace of a presidential candidate is not a new phenomenon. The ‘birther’ movement was alive in the 1800s, including during the 1880 election when Vermont’s Chester A. Arthur was the Republican Vice Presidential candidate. Some claimed he was born in Quebec or Ireland. Author Kenneth Davis provides details of why Arthur’s citizenship was called into question. One man is dead and another critically injured after a gunman open fired in a Montreal theater late Tuesday night, during a political victory speech.